A scene from the film Battle of Algiers. FILMS ABOUT revolution, liberation, and the desire for peoples to be free will be screened at the Féile Scannán na Réabhlóide/Films Concerning Revolution 2016 festival in Connemara on Friday, Saturday, and Sunday. Close to 20 films and documentaries will be shown on three screens. 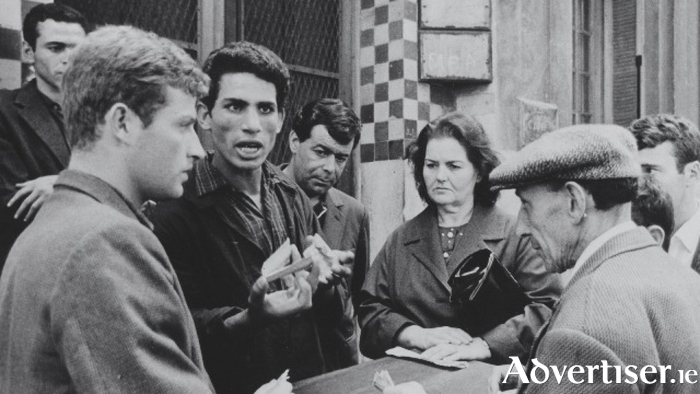 The programme marks the 1916 Rising centenary through Mise Éire (1959 ) and A Terrible Beauty (2013 ); will screen the classic Battle of Algiers (1966 ) which portrays the rising of Algerians against their French colonizers; the visually stunning Cuban/Russian co-production Soy Cuba (1964 ) which restages the Cuban people's uprising against the Baptista's dictatorship; and October (1928 ) which deals with the 1917 Bolshevik Revolution in Russia. Other films to be shown include Persepolis (2007 ), Marjane Satrapi's graphic portrayal of her life in pre and post-revolutionary Iran, and Man of Iron (1981 ) in which Andrzej Wajda surveys the revolts against the Communist State in post-war Polish history. Films will be screened in the Seanscoil Sailearna theatre, in the Cinemobile, and in the Poitín Still. They will be introduced by historians Mary Harris and Cormac Ó Comhraí; film experts Seán Crosson and Jeannine Woods; filmmaker Bob Quinn; former Galway county councillor Seosamh Ó Cuaig; activist Máire Treasa Uí Cheannabháin; former SIPTU leader Des Geraghty; and former Socialist Party TD Joe Higgins.